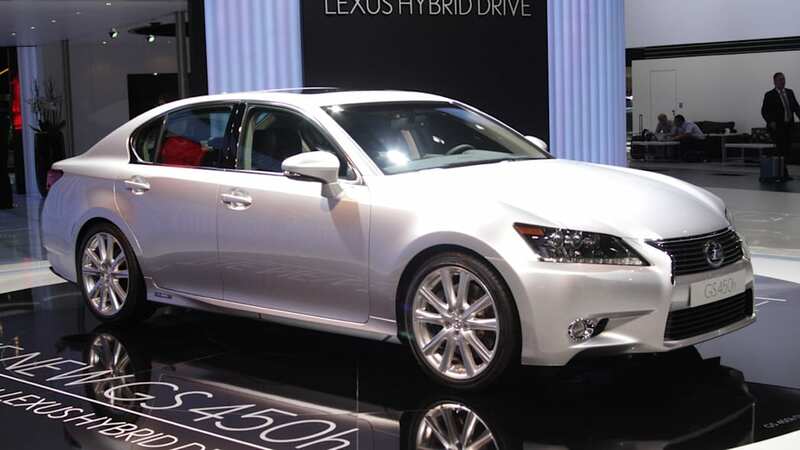 What might the 2013 Lexus GS 450h add to the additional performance goodness delivered in the 2012 Lexus GS 350? More power and more fuel efficiency, for starters. The second-gen hybrid system boots out 338 total horsepower for a 5.6-second sprint to 60 mph. That's 32 hp more than the GS 350 and a 0.1-second improvement on the stoplight run. Fuel economy gets an "expected" 30 percent improvement – the quotes meaning the sedan's fuel use hasn't been officially certified, but anything in that ballpark will be a tremendous gain. If it's a GS 350 with instant torque, that would be enough for us, but we'll look forward to driving it soon and finding out ourselves. A press release lays out the particulars and our gallery of high-res photos shows them off. FRANKFURT – Sept. 12, 2011 - With a five vehicle hybrid line-up, Lexus reinforces its commitment to hybrid technology with the all-new 2013 GS 450h. 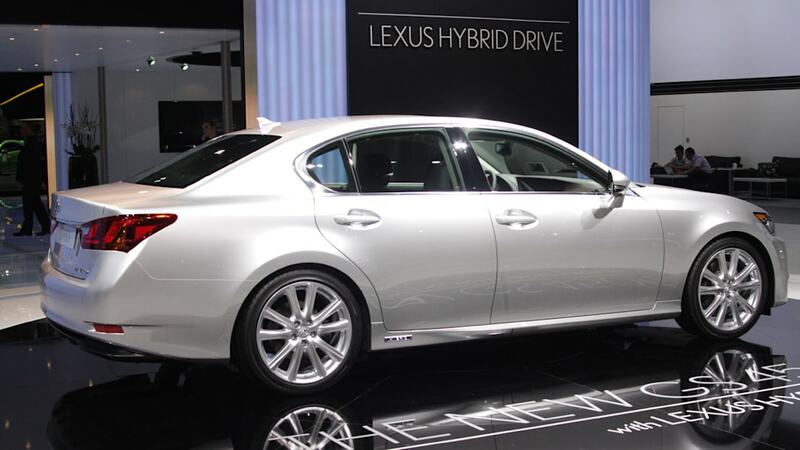 When it was introduced for the 2007 model year, the GS 450h was the first hybrid-powered luxury sport sedan to enter the market. 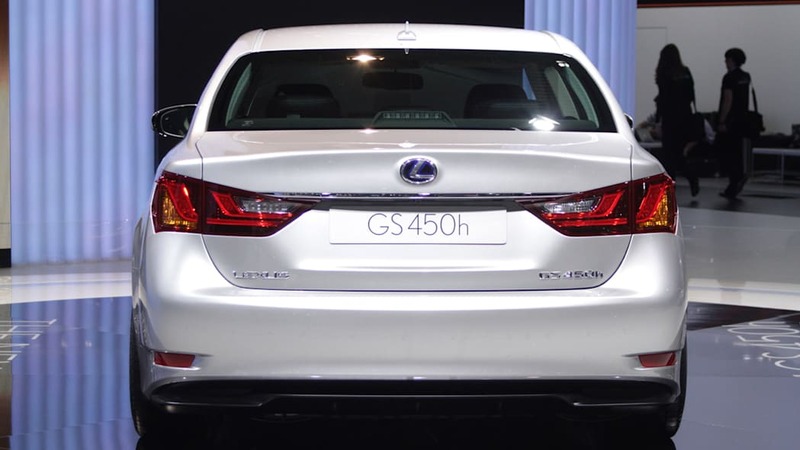 Today, the GS 450h is the world's first premium performance sedan to be equipped with a V6 Atkinson cycle gas engine and two-motor hybrid system, in a front engine rear-wheel drive vehicle. "The all-new GS 450h will provide our customers with an exciting blend of performance and precision in a new hybrid package," said Mark Templin, Lexus group vice president and general manager in the U.S. "With its dynamic exterior styling, roomy interior and advanced technology features, the GS 450h further demonstrates Lexus' mastery of the luxury hybrid." In addition to the gas engine and electric motor, the new GS 450h's hybrid drive system a generator; a high-performance nickel-metal hydride battery; a power split device which, via planetary reduction gears, combines and re-allocates power from the engine, electric motor and generator according to operational requirements; and a compact power control unit to govern the high speed interaction of the system components. A high compression ratio of 13:1; a new, mid-port intake tumble generator; and the adoption of the latest evolution of Lexus' four-stroke, direct injection technology, D-4S, help the GS 450h achieve better fuel consumption. The cooling performance of the hybrid system's Power Control Unit (PCU) helps reduce fuel consumption and has been improved through the adoption of dual cooling paths and a single-piece, integrated AC/DC converter. The electric motor features lighter mounts and reduced friction. The system's regenerative braking operation range has been expanded, contributing to further improvements in fuel efficiency. In addition, the battery layout has been redesigned. A new stacked configuration maximizing luggage space allows the 2013 GS 450h to have more cargo area than the previous generation gas model. 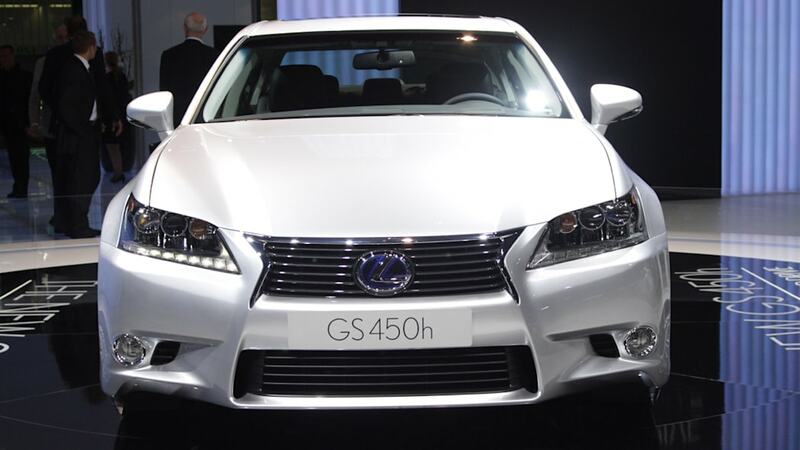 The GS 450h also offers the Lexus Dynamic Handling system, an integrated four-wheel steering system. The leading edge platform technology of the Lexus Dynamic Handling system offers Lexus' first integration of Adaptive Variable Suspension (AVS); Dynamic Rear Steering (DRS); Variable Gear Ratio Steering (VGRS); and the latest generation of Lexus' unique Vehicle Dynamics Integrated Management (VDIM) system to help coordinate every aspect of front and rear wheel control and provide agile, sharp and confident driving behavior with a more direct response to the driver's actions. The Lexus Dynamic Handling system integrates the control of the Electric Power Steering (EPS), VGRS and newly developed DRS. Monitoring vehicle speed, steering direction and driver inputs, the system calculates the optimum angle for all four wheels. Using VGRS to the front and DRS to the rear, the system can independently control both front and rear wheel steering angles to help improve turn-in response, rear grip, vehicle stability and overall agility when cornering. The DRS system monitors vehicle speed and yaw rate, steering angle and speed, and lateral G to calculate the required rear wheel steering input, to a maximum of 1.5 degrees. At speeds below 50 mph the front and rear wheels turn in opposite directions. At speeds over 50 mph, front and rear wheels turn in the same direction. Further coordinating DRS with VGRS, AVS and VDIM, the Lexus Dynamic Handling system will automatically customize the adaptive suspension tuning and active safety systems to suit road conditions, vehicle speed and driving style, giving customers confidence to experience the new GS' exceptional driving performance. 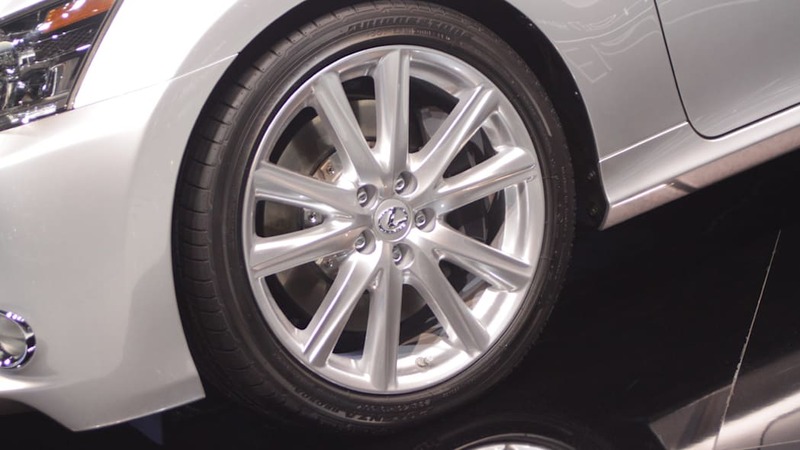 The standard 17-inch alloy wheels are paired with 225/50R17 tires while the optional 18-inch alloy wheels are equipped with 235/45R18 tires. The GS 450h's Electronically Controlled Braking (ECB) system characteristics have been modified to provide greater responsiveness from the first touch of the pedal. Like the GS 350, the GS 450h will be standard equipped with 10 airbags, including a knee airbag for both driver and front passenger. Rear seat occupants have seat-mounted side airbags, and all four outboard occupants are equipped with side curtain airbags. Also standard are new Whiplash Injury Lessening (WIL) front seats that reduce the space between the occupant's head and headrest, to help limit excessive head movement, and help decrease the severity of whiplash-type injuries in certain types of collisions. Standard seatbelts with pretensioners with force limiters used for front and outboard rear seats further assist occupant protection. Available options to help further enhance safety include a pre-collision system, which uses the dynamic radar cruise control system to provide early warning of upcoming objects that might result in a collision. The system also uses a Lexus first infrared camera to monitor the driver's eyes to check on driver status. In the event that the driver does not appear to be looking forward when a collision appears imminent, the system will initiate the warning at an earlier threshold. If the driver still does not respond and make the appropriate maneuver, the system will initiate light braking intervention up to two seconds prior to impact, designed to help to lessen the severity of the collision. 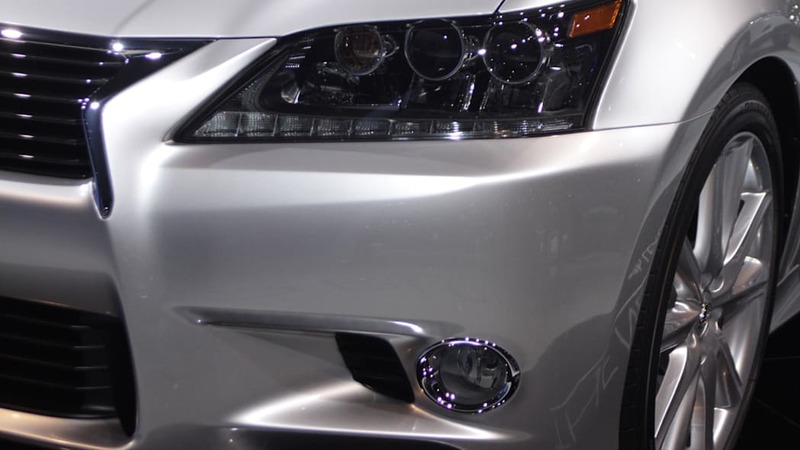 The 2013 GS expresses a new generation of Lexus' design philosophy with its precisely sculpted exterior and will lead the rest of the lineup in an entirely new direction. When designers shaped the GS they visualized the flow of air around it and, like the LFA supercar, maximized aerodynamic efficiency. 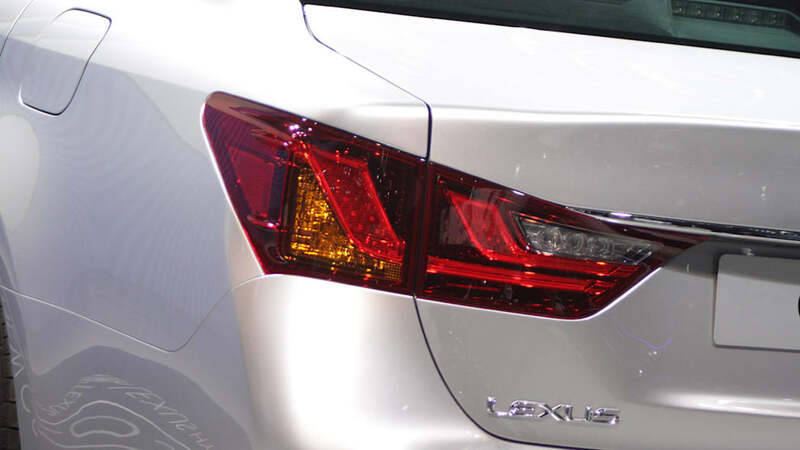 Exclusive to the hybrid model is a unique three-lamp design that aligns the turn signal and Lexus-first high and low beam LED lamps in a single horizontal row. The improved illumination and beam range provided by LED lamps offers better visibility even under low beam driving conditions. 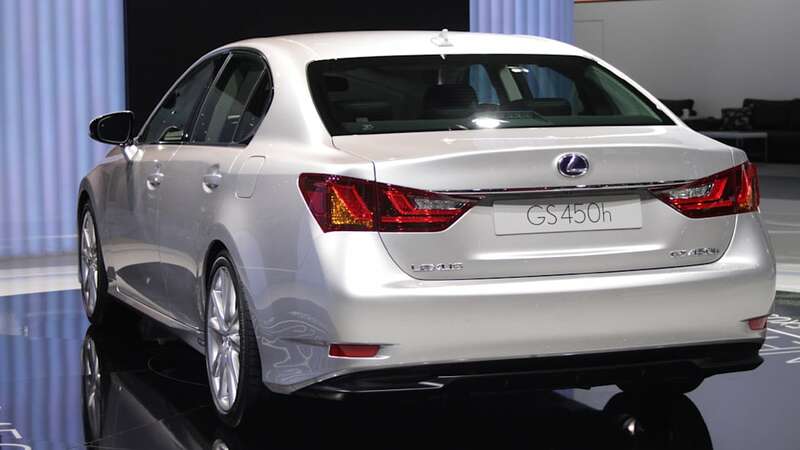 In addition, the rear bumper of the GS 450h covers the exhaust pipe apertures. 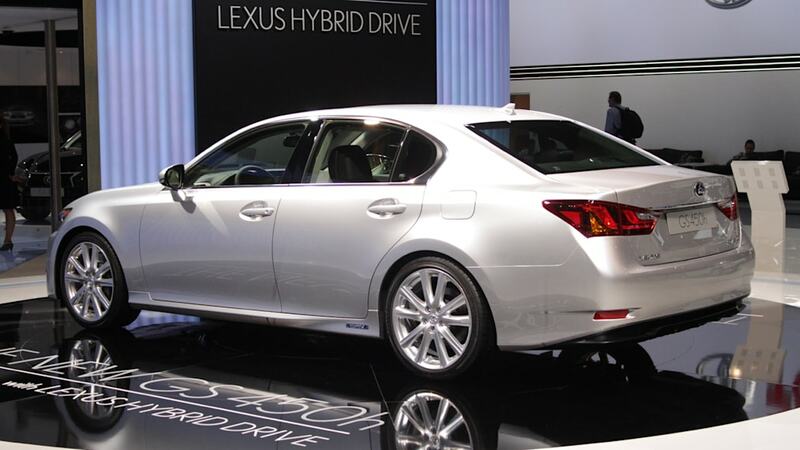 The GS 450h can also be distinguished by Lexus' signature blue hybrid badging. The signature spindle grille with its trapezoidal contours evolved from current Lexus styling and fully integrates into the aggressive front bumper allowing for efficient airflow. 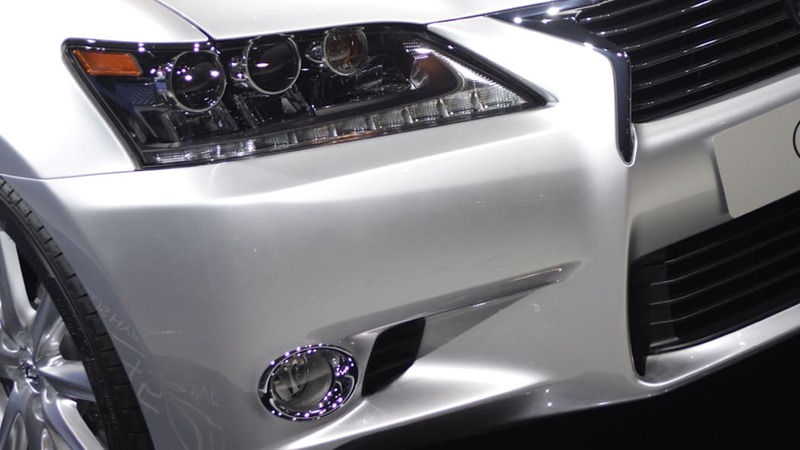 This distinctive Lexus design feature combined with the deep-set, high-tech headlamps and L-shaped LED daytime running lamps further express the vehicle's confident and dynamic character. 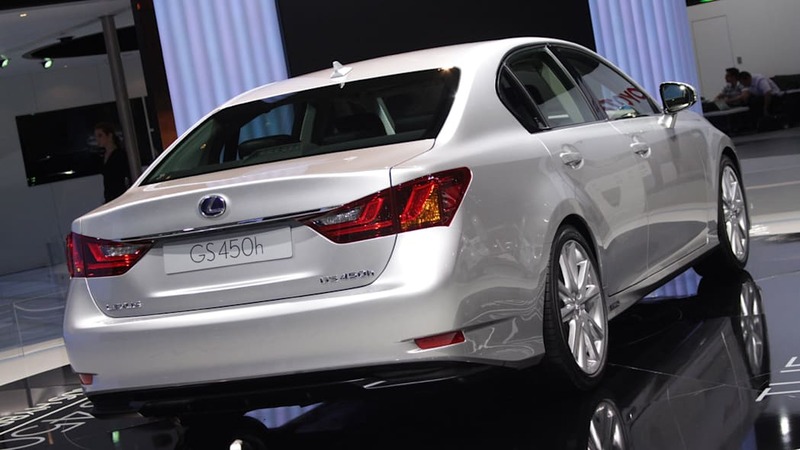 From the side, the GS projects the image of a spacious sport sedan with a road-hugging wider stance. The tapered lower rocker panel and the short front overhang give the vehicle a sense of motion. Width-enhancing front and rear wheel arches adds an athletic stance enhancing the vehicle's dynamic presence. 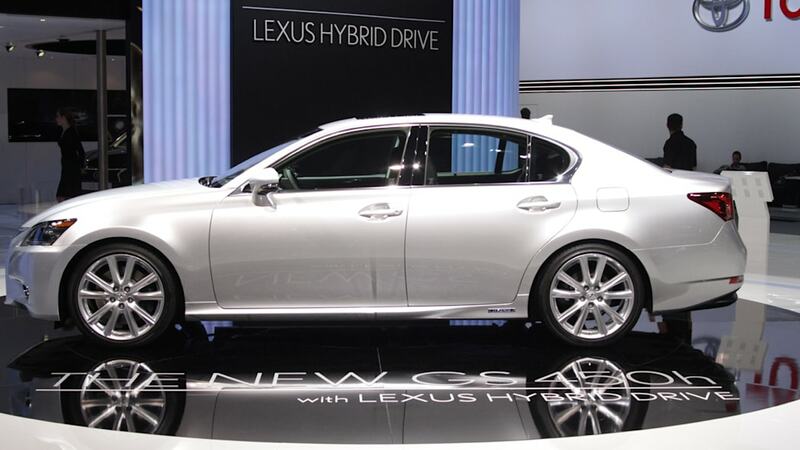 "There is no other mid-luxury hybrid like the new GS 450h," said Lexus'Templin. 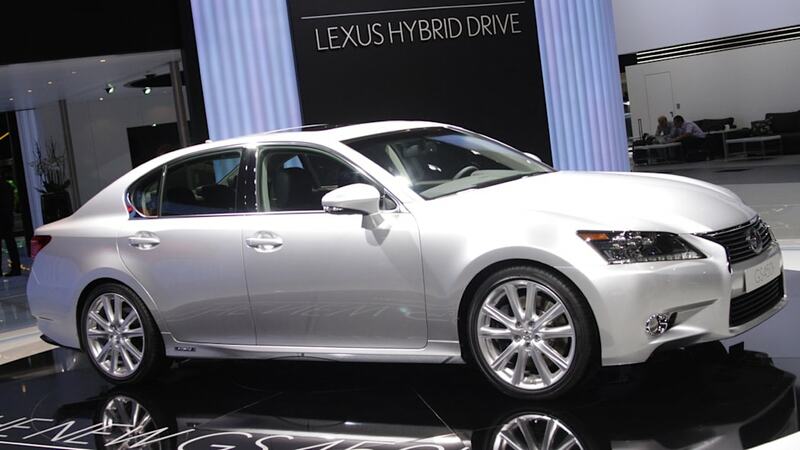 "The handling, acceleration, and design of this Lexus hybrid are impeccable. We can't wait for customers to drive one."